Polyethylene ( PE6 3 , PE8 0 a n d PE1 0 0 ) a n d polypropylene are thermoplastics with excellent properties for the application of water and sewer, as well as for the fabrication of containers for liquids and solid materials. The environmental friendly polyethylene and polypropylene are resistant to many chemicals and very suitable for conveying and storing various liquids. - Polypropylene-none-flamable (PP-S) highstiff polypropylene can be used, if you are interested ask for futher information and data sheets. Pipe Diameter KRAH MISR pipes can be produced with internal diameters (ID) from DN 300mm to DN 4000mm. 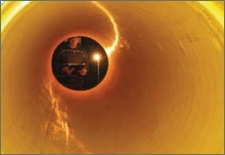 The nominal diameters (DN) coincidents with the internal diameter (ID) of the pipe. 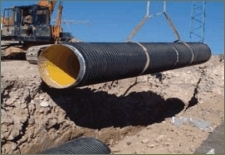 Pipe length The standard laying length (L) of the KRAH MISR pipes is six meters. In addition it is possible to produce continuously any length between one and six meters. 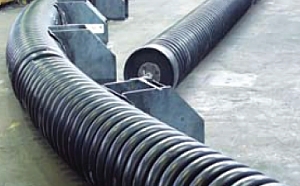 Lengths up to 18m consisting of 3 pipe sections are common. 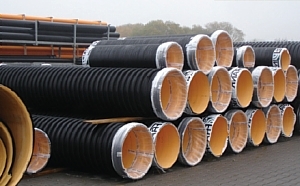 Wall thicknesses Both profiled and solid wall pipes with wall thicknesses up to 300mm can be produced. 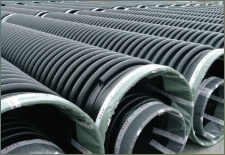 The quality of the pipe is highly depending on the quality of the waterway wall, therefore all KRAH MISR pipes are usually produced with a minimum waterway wall of 4mm. Profiled - Wall Pipe A profiled pipe has a very low weight, but at the same time can be used for high load applications. 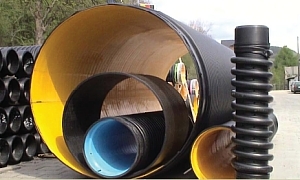 less material is needed to produce a pipe with the same statical properties than a solid wall pipe, which means significant savings in material costs. The supportable static load is determined for every profile geometry by the factors elastic modulus (N/mm2) of the respective material and the moment of inertia of the profile geometry [mm4/mm] referring to the pipe diameter. The result is called ring stiffness. By using a profile design pipe, the weight can be reduced up to 65% compared to a solid wall pipe with the same ring stiffness. KRAH MISR pipes offer the best security and durability. 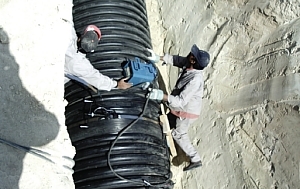 Internal Pressure The KRAH MISR pipe sewage System can withstand low working pressure up to 3 bar. And for pressure pipes, The working pressure up to 16 bar, depending on the thickness of the waterway wall (s1). Equivalent to DIN 8074 the hoop stress formula can be used with s1 as the minimum wall thickness. 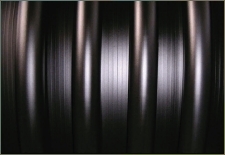 Co-extrusion If requested all pipes can be delivered either with a bright, inspection friendly or an electro-conductive inner surface made by the co-extrusion process.